This book summarizes recent advances in understanding the mechanism underlying the selective cell death of dopamine neurons in Parkinson's disease. MPTP, endogenous neurotoxins, L-DOPA, and metal were proved to induce apoptosis and necrosis in neurons. The relationship of these causal factors to the pathogenesis of Parkinson's disease was discussed to give us overviews on the role of neurotoxins in this degenerative disorder. This title further presents the intracellular signal transduction, and the related enzymes and other factors involved in dopaminergic neuronal death. Recent results on intracellular mechanism of neuroprotection are presented, suggesting that neuroprotection as a causal therapy of neurodegenerative disorders may become practical in near future. This book shows new neuroprotective agents, such as propargylamine derivatives and neurotrophins, and the intracellular mechanism to prevent the activation of apoptotic cascade in neurons. The authors of this book are active researchers participating in these subjects and the readers will find the knowledge and techniques for the study on neurotoxicity and neuroprotection, and the strategy for future research on these important subjects in clinical and basic neurology and neurosciences. 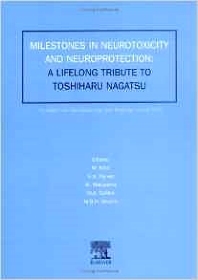 The book is dedicated to Professor Toshiharu Nagatsu, a pioneer in the search for pathogenic factors in Parkinson's disease. The book is reprinted from the journal 'Neurotoxicology and Teratology', Volume 24/5. Laudatio. Conformational diseases: Misfolding mechanisms may pave the way to early therapy (C. Reiss et al.). Editorial. Tribute to Professor Toshiharu Nagatsu (M. Naoi et al.). Reviews. Amine-related neurotoxins in Parkinson's disease: Past, present, and future (T. Nagatsu). Potential neurotoxic "agents provocateurs" in Parkinson's disease (M.A. Collins et al.). Dopamine-derived endogenous N-methyl-(R)-salsolinol: Its role in Parkinson's disease (M. Naoi et al.). N-methylation underlying Parkinson's disease (K. Matsubara et al.). Apoptotic molecules and MPTP-induced cell death (A. Nicotra, S.H. Parvez). MPTO: Insights into parkinsonian neurodegeneration (S.G. Speciale). Influence of neuromelanin on oxidative pathways within the human substantia nigra (K.L. Double et al.). DOPA causes glutamate release and delayed neuron death by brain ischemia in rats (Y. Misu et al.). Manganese-induced apoptosis in PC12 cells (Y. Hirata). Physiological role of salsolinol: Its hypophysiotrophic function in the regulation of pituitary prolactin secretion (B.E. Töth et al.). Aliphatic propargylamines as symptomatic and neuroprotective treatments for neurodegenerative diseases (M.D. Berry, A.A. Boulton). Neuroprotection by propargylamines in Parkinson's disease: Suppression of apoptosis and induction of prosurvival genes (W. Maruyama et al.). Docosahexaenoic acid attenuated hypertension and vascular dementia in stroke-prone spontaneously hypertensive rats (S. Kimura et al.). Diabetic neuropathies in brain are induced by deficiency of BDNF (A. Nitta et al. ).